Whoever had the idea of sending round a little brochure every few weeks for me to order makeup from deserves an award and a whole lot of money, it is so much fun flicking through the pages and discovering good quality affordable makeup! 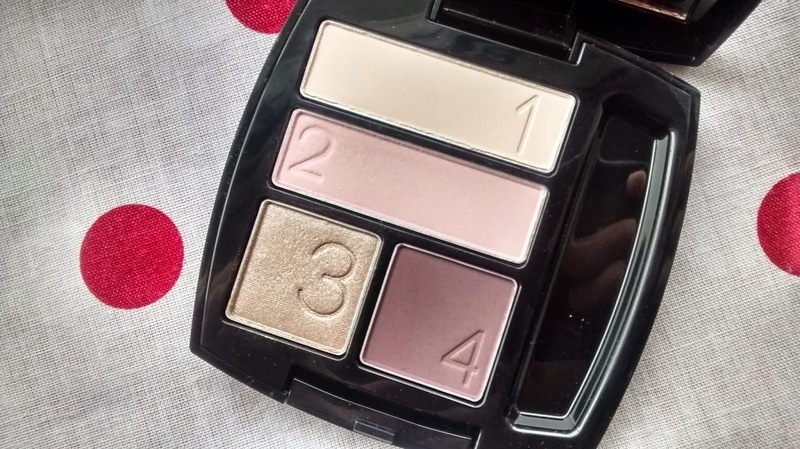 The last brochure saw me purchasing this palette, especially made for green eyes, I was intrigued to see how it would make my murky green eyes look, if it would make them vibrant or not. 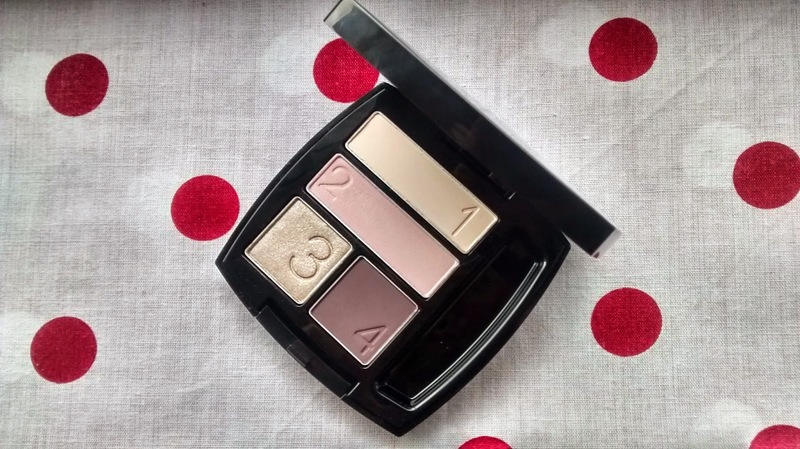 The quad has the standard Avon packaging, the misshapen square, which is a shiny black. It is quite sturdy and on the inside of the compact has a decent sized square mirror which is brilliant if your in a rush or can’t find a decent mirror. 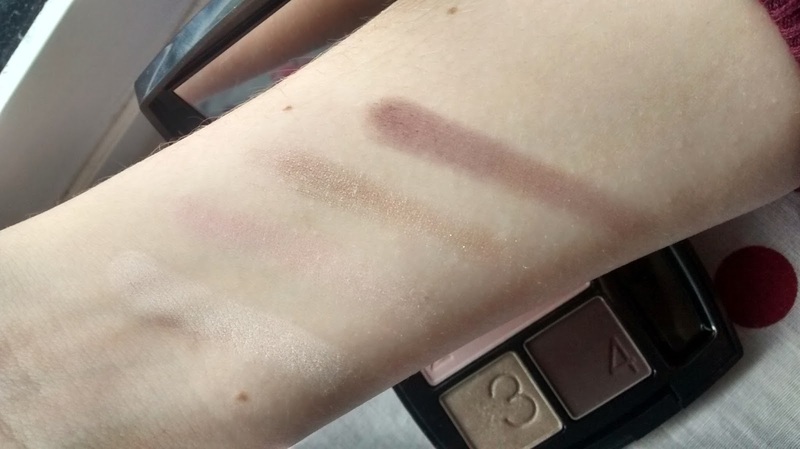 The shadows are set out in quite an interesting way compared to other brands who set them out in a generic line or squares of product. The quad also comes with a double ended sponge tipped applicator which is pretty useless, in my opinion, for anything but swatching. So the green eyes palette has four eyeshadows to help enhance your natural green eyes. These shades are all numbered, and on the box it shows you where to apply, though it is quite easy to work this out for yourself. Shade 1 is a very pale creamy coloured shade, it works well along the brow bone and in the inner corner as a highlight. Shade 2 is a dusty pink with a tiny bit of silver glitter which looks nice all over the lid. Shade 3 is quite hard to describe, it looks like a grey toned coppery colour, again with tiny bits of silver glitter. This looks nice under the eye near the bottom lash line. Shade 4 is a matte deep purple which is good for adding definition to the crease. These shadows aren’t the most pigmented but at the same time they aren’t chalky, however they can take a little bit of time blending. I would always wear a primer underneath these as it will help them last. Also if you have a white eyeshadow crayon like NYX Milk you could use that underneath to help the colours appear more vibrant. Overall this does make my eyes seems a bit less murky pond water green but it doesn’t transform them enough for anyone but yourself to realise. I plan to continue using it for the shadows as the colours do appeal to me, so when it comes down to it, this was a pretty good purchase!